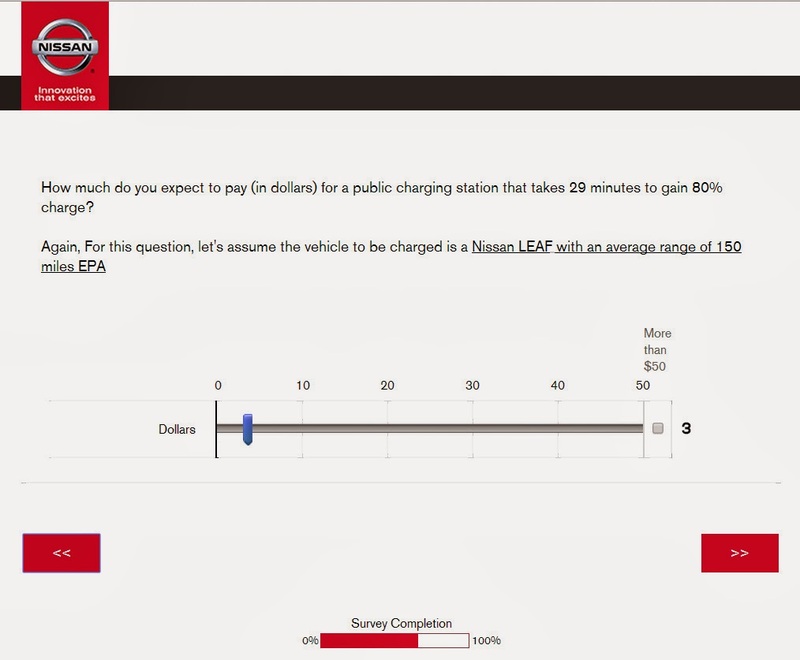 A survey question is far from a product commitment, but it shows that Nissan is thinking about their next gen longer range EVs. 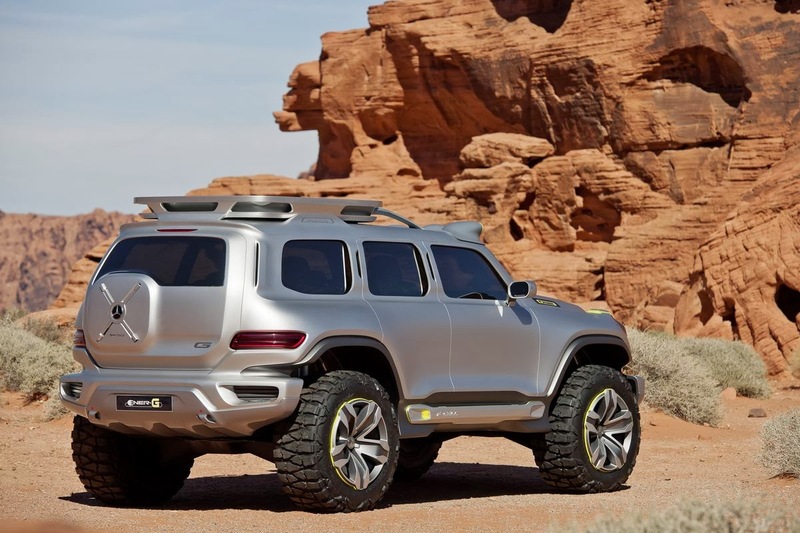 So GM and Tesla are not the only ones that will be fighting for the affordable long range EV. Nissan has a head-start over both of them in the affordable pure-EV market space and they are not going to give it up easily. 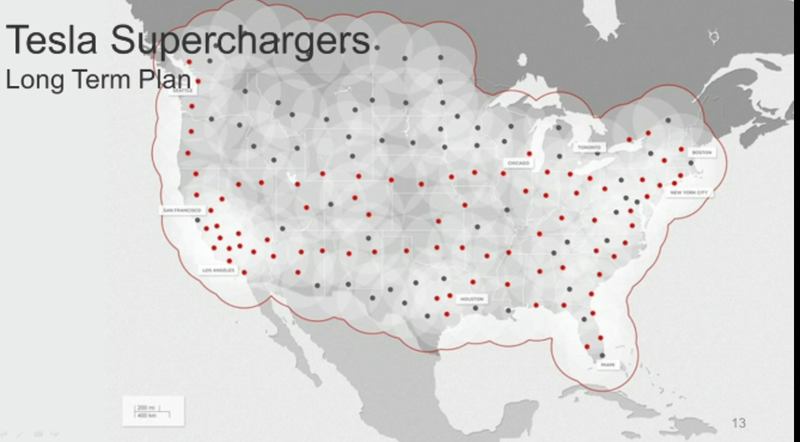 This money could have installed more that 1400 CHAdeMO stations. As more plug-in vehicles come to market and prices continue to drop, so does the public’s appetite to change from conventional fuel vehicles to cars w/ cords. Earlier this week Energy Secretary Ernest Moniz highlighted the fact that PEV sales doubled in 2013 over 2012 and that the Energy Department is investing nearly $50 million more to improve fuel efficiency in vehicles, including nearly $30 million for PEV technologies(1). 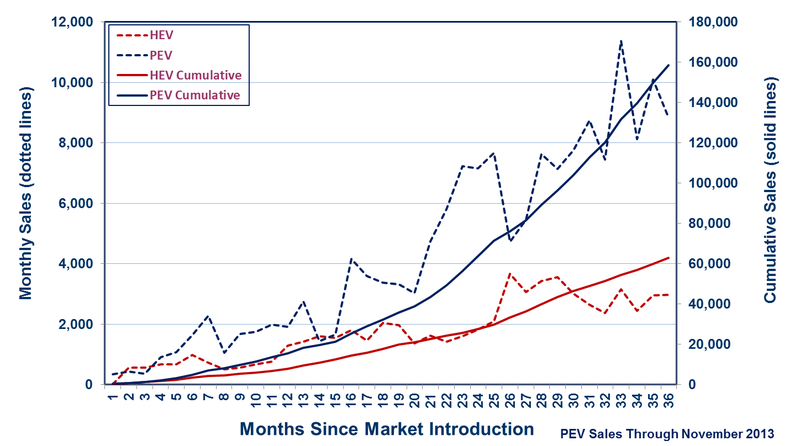 The graph above illustrates that plug-in vehicles’ rate of sales is actually higher than the rate of growth hybrids experienced in the same time period after their market introduction. 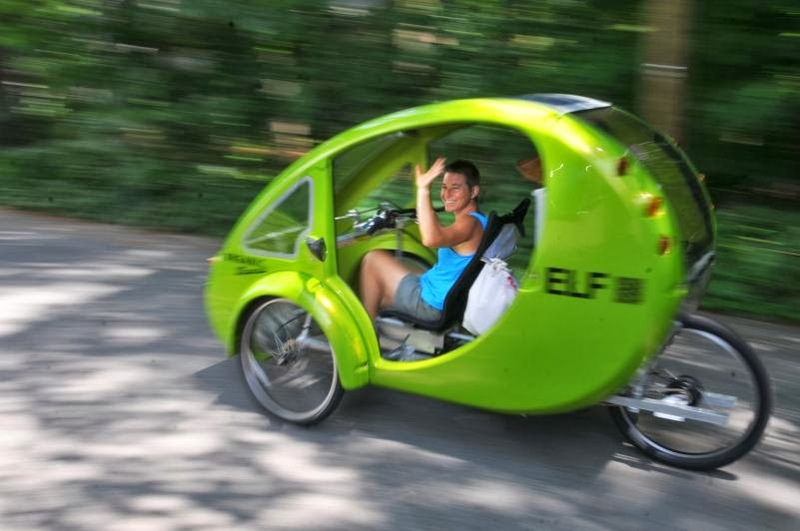 The West Columbia Gorge Chamber of Commerce would like to invite you to test-drive an innovative pedal-electric hybrid vehicle called the “ELF”. The ELF is made by the Organic Transit company. They are looking establish a manufacturing presence in Portland area. Wood Village Mayor Patricia Smith will sponsor and attend the event. Registration: Send an email to testdrive at organictransit.com with "Portland" in the subject line. The future of transportation -- as seen by a sci-fi author | VentureBeat | Gadgets | by William Hertling/FeldThoughts: "By 2025, that Nissan Leaf battery pack will cost less than $1,800, making the cost of the electric motor plus battery pack less than the price of a comparable gasoline motor. Assuming even modest increases in storage capacity, the electric vehicle will rank better on initial cost, range, performance, and ongoing maintenance and fuel costs." Electric Dreams: 11 Cars Worthy of a Look in 2014: "Electric vehicles may be hitting their stride. As drivers continue to see the benefits and automakers continue to improve on them, it’s likely that electric vehicles will only continue to gain in popularity." 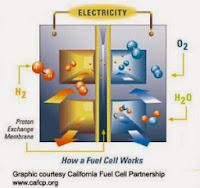 Fuel Cell Future Unlikely or Inevitable? Part 7 - How Soon? In the prior parts, we looked at all the components needed for hydrogen based personal transportation. Each of these puzzle pieces possible, albeit expensive. The logistics and expense required for H2-powered personal transportation will relegate them to little more than concept cars and media stunts for the foreseeable future. 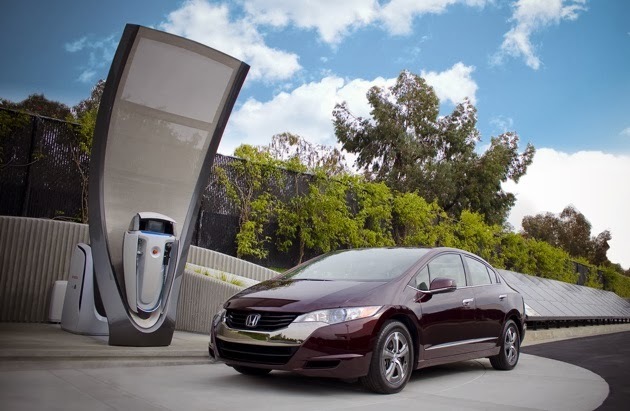 Honda has been leasing their fuel cell vehicle, the FCX Clarity, since 2008. I searched but could not find out how many are on the road today. In 2010, it was reported that there were a total of 50 FCX Clarity available for lease in the US with a target to have 200 available worldwide. Toyota, Hyundai and others that claim they will have FCVs on the market "soon" will likely have similar demonstration projects that put little more than a handful of vehicles on the road near the few filling stations that currently exist. We're looking at hydrogen fuel cells... The car is still too expensive and probably won't be practical until the 2020-plus period. And then there's the issue of infrastructure. 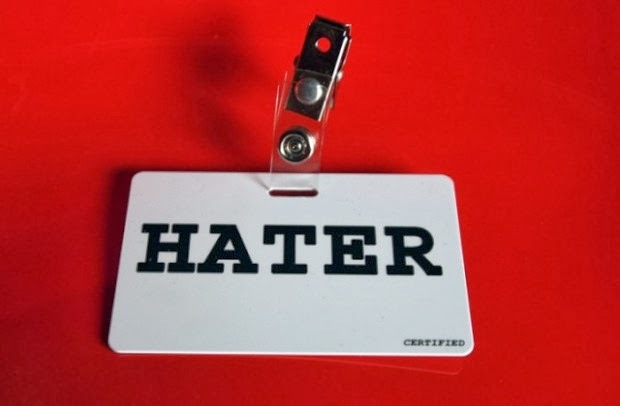 Unless you live within a few miles of a H2 filling station, don't expect that you'll be able to walk into a dealership and drive away in a fuel cell vehicle sporting the new car smell within this decade. 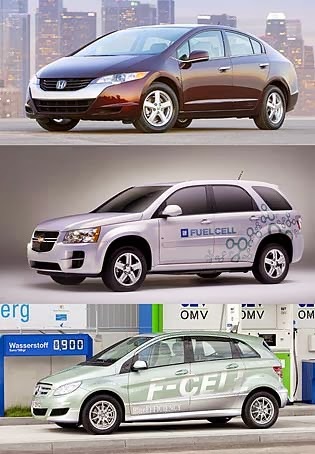 Fuel cells have long been considered a promising technology for circumventing the problem of limited battery range. However, success depends heavily on the price. "So far the high production costs of fuel-cell systems and the lack of infrastructure have prevented the long anticipated launch on the mass market," says Wolfgang Bernhart, Partner at Roland Berger Strategy Consultants. "Even though the costs for manufacturing fuel-cell systems will drop considerably in the future, major technical obstacles must first be overcome before fuel cells achieve a breakthrough in the automotive sector." 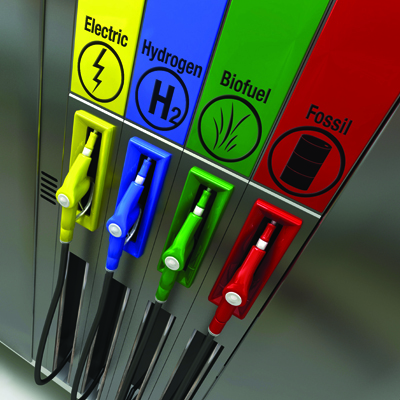 Our study entitled "Fuel cells – A realistic alternative for zero emission?" 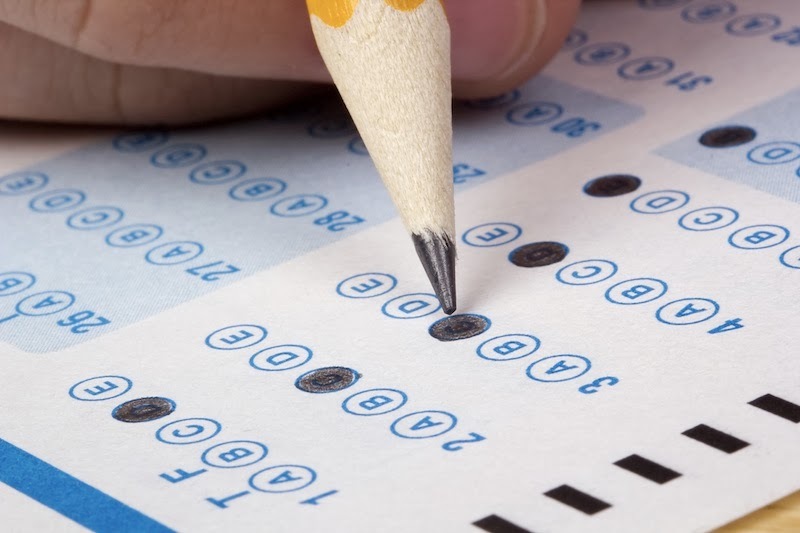 paints a fairly bleak picture of this technology over the medium term. According to our experts it will be possible to cut production costs for fuel-cell systems by up to 80% by 2025. 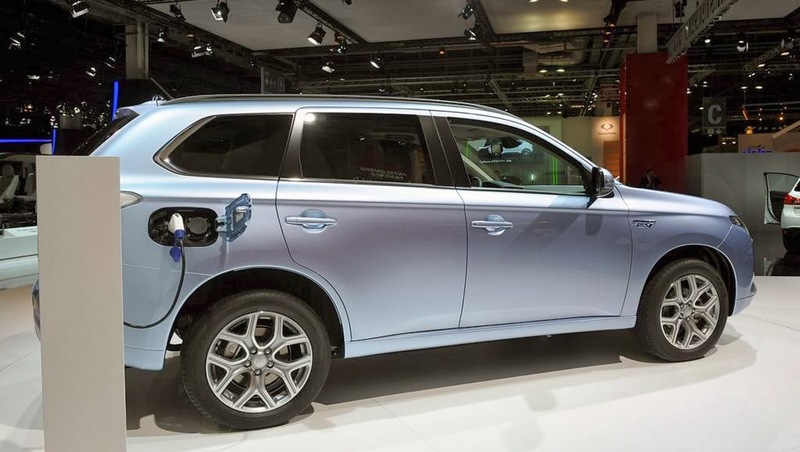 Even though this will provide fuel-cell technology with initial business opportunities, this reduction will still not be enough to achieve a breakthrough on the market. 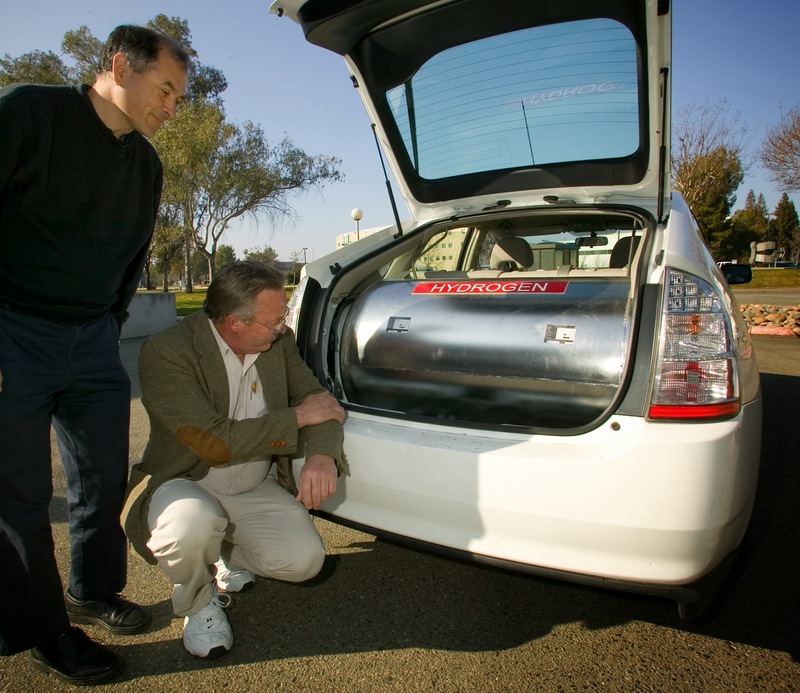 To drive a hydrogen (H2) powered car, once the H2 is generated and distributed, it has to be stored in your car. 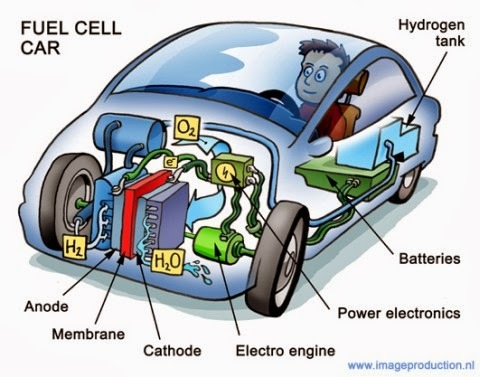 To have a viable range in a fuel cell vehicles (FCV), you are going to need a large amount of H2. If you carried this gaseous H2 along uncompressed, you would need a hot air balloon sized storage. Although methods of binding H2 in solid form or chilling it to liquid have in used in some applications, the method of choice for FCVs is compressing the H2 gas under high pressure, such as 5,000 to 10,000 psi. To handle these high pressures, the tanks have to be very strong. For stationary applications, this can be done with thick metal walls. For mobile applications, like a car, however, these thick-walled tanks are too heavy and reduce the car's performance and range. 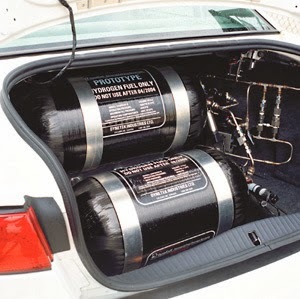 This means, to meet the high strength and light weight requirements, mobile high pressure H2 tanks are made of advanced materials such as carbon fiber. The act of compressing the H2 itself takes energy too. 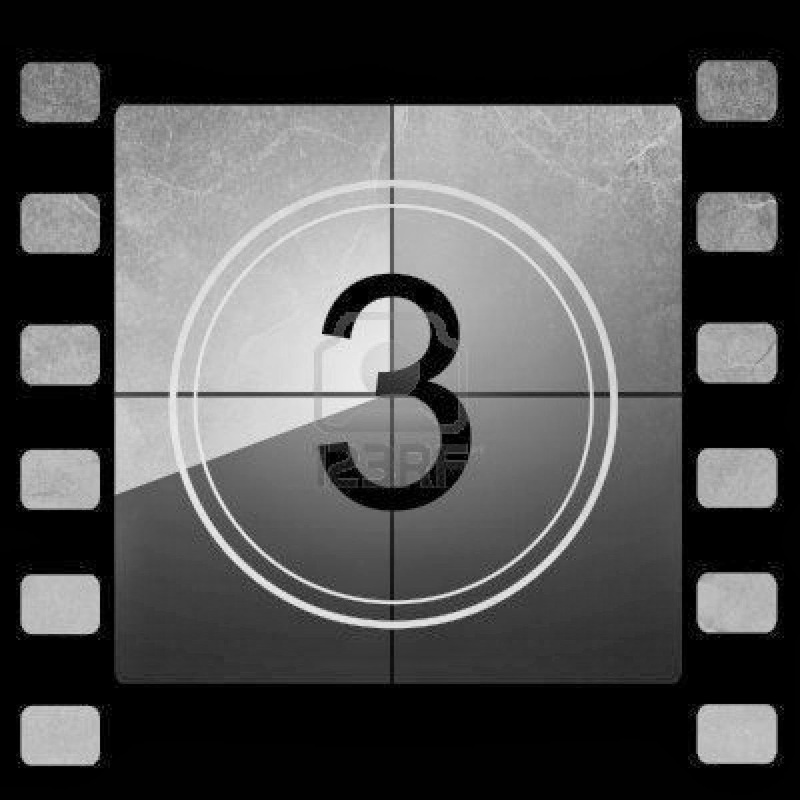 Depending on the level of compression that is used, from 2% to 5% of the energy content is lost to compression and cooling. Hydrogen is tricky to contain. It is a small molecule and it can pass through many solids via a process called permeation. Polymer lined tanks developed in the last decade have reduced this leakage to a near negligible amount. 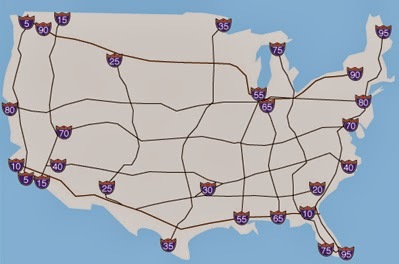 There are over 150,000 gas stations currently in the US. These stations have an average of 6 to 8 pumps each. That is about 1 million gas pumps currently operating in the US. 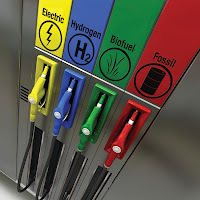 If we are to have a viable H2 fueling infrastructure, for an (eventually) complete hydrogen economy, a similar number of hydrogen filling stations and pumps would be needed. The equipment required for this is, of course, not cheap. It costs between $500,000 and $5,000,000 per installation of an H2 filling station. The price depends on factors such as the number units, pressure, security measures, and the types of vehicles the facility intends to serve (i.e., passenger vehicles or commercial vehicles). One million pumps at the low-end price tag of $500,000 each is a $500 billion dollar expense. Clearly, advances in H2 pumps are needed to reduce the installed cost. Selective installation at fleet accessible areas would be a good way to use H2 without a complete infrastructure. Electric vehicles did not have this same fueling chicken and egg problem that fuel cell vehicles (FCV) and H2 refueling infrastructure face, because, albeit slow, a modern EV can plug into any standard household outlet to recharge. The installation of public charging stations increases the utility of EVs, but it was not a must-have before they were usable. Today, if you want to drive a FCV in a region of the US with H2 infrastructure, then you are driving in Southern California and nowhere else. Perhaps it is "island thinking" that makes Toyota, Honda, and Hyundai think that an H2 infrastructure could easily be deployed (I know South Korea is a peninsula, but it is a political island). South Korea could be completely served by a single H2 filling station, it wouldn't be convenient, but it is possible. Similarly, Japan would only need five or six H2 stations to service the entire country. The US, on the other hand, is a very different story. Rather than extracting H2 from a hydrocarbon, it can be produced by splitting water by a process called Electrolysis. Electrolysis uses two electrodes, an anode and a cathode. During electrolysis these electrodes undergo a chemical reaction. 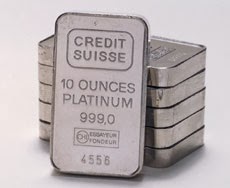 The anode is oxidized and the cathode has electrons stolen from it by a process called reduction. These electrodes need to periodically be replaced. This process does not create CO2. It does, however, have a high energy cost. The electricity generation method will directly impact the CO2 related to H2 generation. Some reports quote an efficiency of 50 to 70% for alkaline electrolysers. There is research into higher efficiency with the use of proton exchange membranes (PEM) and catalytic technologies that could lead to 95% efficiency, but today electrolysis remains an energy intensive operation. The cost of electrode replacement combined with the great energy needed results in only 4% of worldwide H2 being produced by electrolysis today. Because of these costs for electrolysis, steam-Methane reforming remains the industrial method of choice for H2 production. 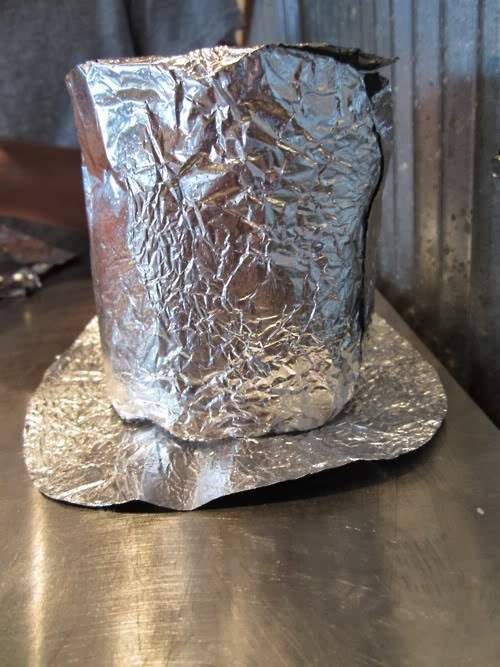 At 2500° C water will spontaneously dissociate. This process is called Thermolysis. With the use of catalysts the dissociation temperature can be reduced. Thermolysis occurs at temperatures that are too high for normal piping and equipment and maintaining such an incredibly high temperature is very energy intensive. The Sulfur-iodine cycle is a thermochemical cycle processes for hydrogen production from water. 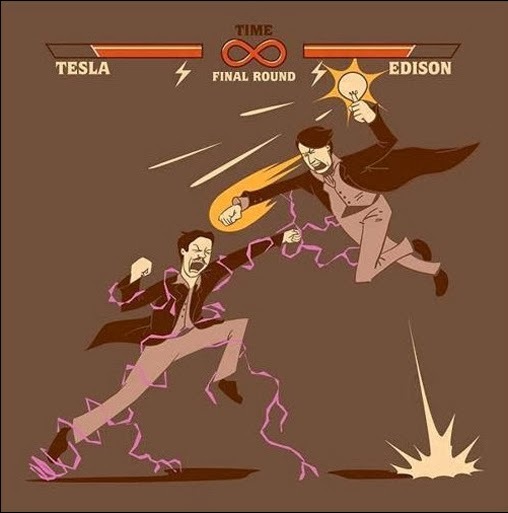 It has an efficiency of approximately 50%. The sulfur and iodine are recovered and can be reused. The cycle requires 950° C temperatures. There are hybrid methods that use both thermochemical and electricity, such as the Copper–chlorine cycle. It operates at 530° C and has an efficiency of 43 percent. 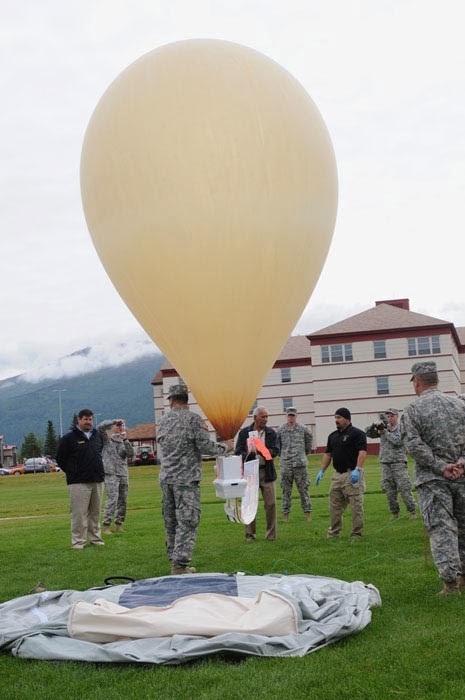 Ferrosilicon is used by the military to quickly produce hydrogen for balloons. The chemical reaction uses sodium hydroxide, ferrosilicon, and water. The generator is small enough to fit a truck and requires only a small amount of electric power, the materials are stable and not combustible. The method has been in use since World War I. A heavy steel pressure vessel is filled with sodium hydroxide and ferrosilicon, closed, and a controlled amount of water is added; the dissolving of the hydroxide heats the mixture to about 90° C and starts the reaction; sodium silicate, hydrogen and steam are produced. 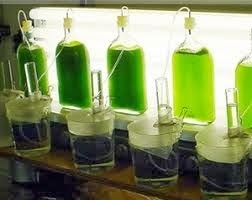 Hydrogen can be produced by algae in a bioreactor. 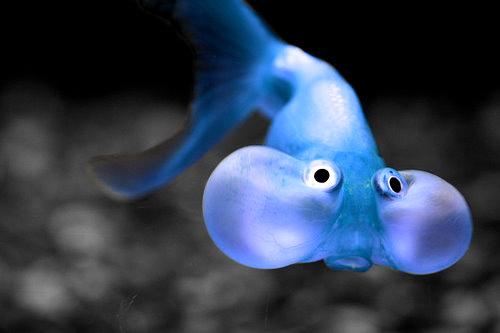 In the late 1990s it was discovered that if the algae is deprived of sulfur, it will switch from the production of oxygen, i.e. normal photosynthesis, to the production of hydrogen. This production is 7–10 percent energy efficiency. Bacteria and enzymes can be fermented to generate H2. Photofermentation uses light, while dark fermentation, as the name suggests, doesn't need light. The process involves bacteria feeding on hydrocarbons and exhaling hydrogen and CO2. A prototype hydrogen bioreactor using plant waste feedstock is in operation at Welch's grape juice factory in North East, Pennsylvania. The amount of H2 that would be needed by the world's transportation sector would require a significant increase in H2 production. For H2 to be seen as a clean, renewable fuel, it has to be sourced from water rather than fossil fuels. All of the methods mentioned above are being researched in hopes of finding a better method for large scale H2 production. Unfortunately, today, water sourced H2 remains expensive and energy intensive. This means that natural gas will be the foreseeable fuel stock for H2 production. 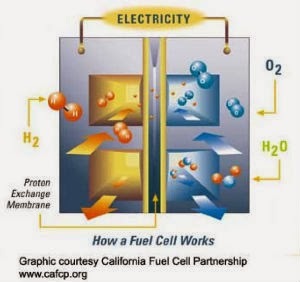 Fuel cell advocates often espouse that hydrogen is the most abundant element in the universe. The only problem with that statement is that here, on Earth, hydrogen is bound to other elements to make things like water and hydrocarbons. To get the isolated H2 that fuel cells need, the hydrogen must be extracted from compounds. 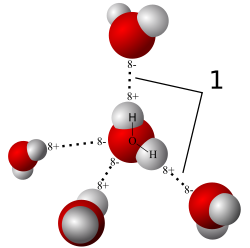 H2 can be derived from water (more on this later). Today, however, it is most often produced by a process called Steam-Methane Reforming. In this process, natural gas (Methane) is combined with high-temperature steam (700°C–1,000°C) under pressures that is 3 to 25 times that of standard atmospheric pressure. With this heat, pressure, and a catalyst the natural gas and steam break down and form hydrogen, carbon monoxide, and a relatively small amount of carbon dioxide. The carbon monoxide is further processed with steam to create more hydrogen and CO2. The H2 from this process is captured and the CO2 is vented into the atmosphere. Generating these pressures and high temperatures requires a lot of energy. Some of the energy used in this process is lost as heat. 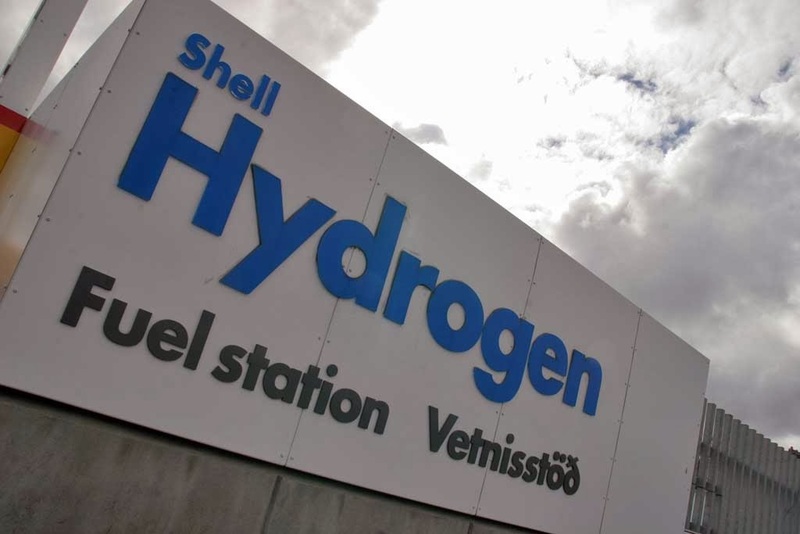 Overall, the process of generating H2 from natural gas is around a 50 percent efficient process – about 50-60 kWh are needed to deliver 1 kilogram of hydrogen. If you could extract 100% of the energy available in the H2, you would get 25-30 kWh back. 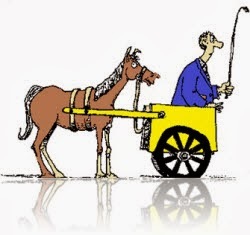 Detractors will point out, that using Methane derived H2 is simply moving the transportation sector from one fossil fuel (oil) to another (natural gas) and the energy used by this process generally involves CO2 emissions also, which offsets much of the potential environmental benefit when using H2 produced in this manner. So let's look at water sourced H2 in our next post.